We’ve thought long and hard and brainstormed insanely to come up with as many ideas as possible for our ecommerce project detailed in our previous blog post ‘An Ecommerce Masterclass Part 2 – Ideation’. We got our ideas down to three areas which were; Sports Equipment Products, T-shirt Designs and Framed Art. After much discussion in the office we quickly abandoned the idea of retailing sports equipment. One of the main reasons was the fact our knowledge on sports equipment is quite limited and we thought we would have to spend too much time trying to understand the products and the processes. This left us with designing our own t-shirts or something around the area of selling art. We felt confident in designing a range of t-shirts as well as being able to find a cost effective supplier through our network. Our research also proved fruitful and the market seemed to be able to cope with another t-shirt retailer. We also found that although there would be lots of competitors, many took a slightly different stance so there could be a niche we could focus on. When we started to discuss the idea of selling art we new it would have to be unique. We didn’t feel confident in buying art and then reselling it for the same reason as the sports equipment. As we completed our initial research we didn’t see a market for this but we did see some interesting companies selling very unique items. One of our team members (Nick) proved to be an advocator of the unique art idea stemming from his background as an illustrator. 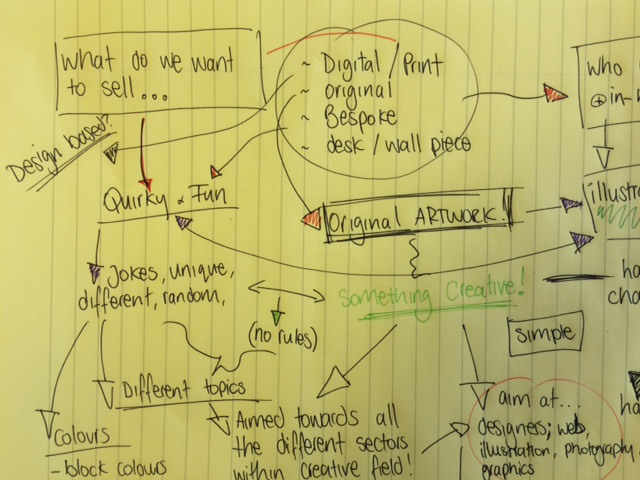 After some further discussions we wanted to explore the idea of creating unique art further as we felt there was more scope for this to be successful as well as a bigger scope to put our own stamp on it. Back to the research board we went. This time we wanted to look further into the idea of the unique art, looking at possible directions we could take it down and what the final idea could be. We tackled this exactly as we tacked the general research in the last blog post. Pen and paper was our weapon and we spent hours thinking of different directions we could take. After we completed our research, we found one area we all thought would be brilliant for us to move forward with. It played perfectly on our skills and knowledge. With our in-house illustrator we decided it would make sense to utilise our skillsets to create our own unique art. Alongside this, as we understand the creative community we decided to make art that people within the creative community – people like us – would really understand, appreciate and relate too. an online store selling unique pieces of printed art that we’ll create in house, targeted at members of the creative community. Now we have our idea our next step will be to think of a name and secure our domain name. We’ll then move on to branding our business, sourcing suppliers for the printing and creating our art. As always we’ll detail everything on our blog.